Get a Grasp on Your Gut! Although it can be a sensitive subject, your digestive health is a huge clue into your overall health and well-being. With the rising rates of food sensitives and gut related disorders such as IBS, Chrons, and Celiacs in both adults and children, this is an important topic to be well educated in. Your digestive health determines how many nutrients you absorb from your food and that is key in how energized you feel throughout the day and how healthy you are overall. Another important role of your gut is removing waste from your system. If it’s not being removed as it should, the waste will build up inside of you and not only will that not feel very great but it will become a toxin and lead to other health issues as well. Additionally, there has been a huge rise in what’s known as leaky gut. This is when holes form within the digestive tract and allow food particles other otherwise waste products into the blood stream. Do you think that is a good thing for your body or a bad? I hope you said bad because it is very bad! When that happens, your body recognizes the foreign invaders and starts an immune response to get rid of it and it increases the amount of inflammation in the body overall. Initially, that is a good thing and an intelligent process within the body. However, the issue is when that is happening over and over. That is a way autoimmune disorders, which are also on the rise, begin inside the body. The body starts attacking itself because there are things in the blood that shouldn’t be there. The body is acting intelligently but over time, this response can be detrimental to that person. So what’s going on? Why are people struggling so bad with their digestive health? No, it doesn’t help that our food is more toxic and foreign to our bodies than ever which cause the inflammation in the gut that create those holes in the first place. But another huge component to it is what state the nervous system and brain are operating in. 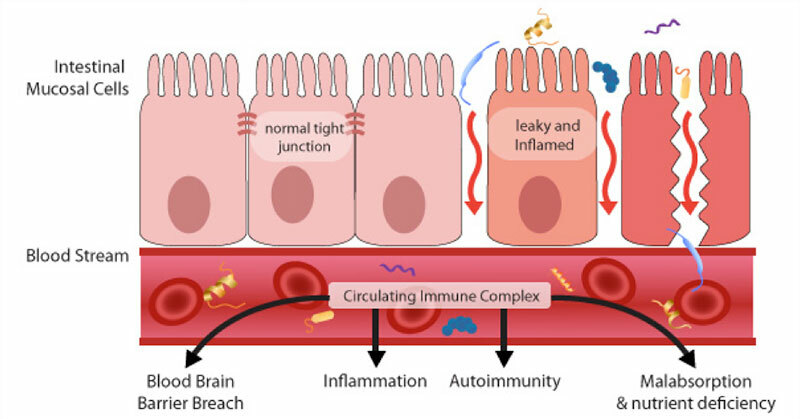 The brain and the gut are hugely connected and this connection has gained a lot of attention within the last few years in which people are able to heal their brain by healing their gut which is amazing. But, it goes the other way too! People are also able to heal their gut by healing their brain. It is the brain and nervous system that is ultimately controlling the digestive system so it makes sense that if the nervous system is functioning as it should, it will send proper signals to the gut and that should work the way that it should as well. The part of the nervous system that specifically controls how well the digestive system is working is the parasympathetic side. The parasympathetic state is what controls sleeping, healing, development and digestion! The issue is when the nervous system is stuck in the other part; the sympathetic side which shuts off the digestion because it’s only concern is survival! Our body automatically goes into the sympathetic state when we are under stress which I think we can all agree is a lot of the time both in adults and sadly kids. Because of that, most of society is operating from the sympathetic state and their parasympathetic state is turned way down when it needs to be turned way up to function optimally. This is why the rates of IBS, Celiac, Chrons, food sensitives and overall digestive issues are on the rise. A lot of people are suggesting we clean up the diet right away and stop eating the foods that cause inflammation in our gut. I completely agree with them! As a collective, we need to eat rich, nutrient dense, anti-inflammatory foods and cut back on the sugars and processed foods. However, we need to make sure that our nervous system is functioning optimally first! If your body is still in a sympathetic fight or flight state, the digestive system still won’t work properly even if you are eating a completely clean diet. Remember it’s the nervous system that ultimately controls the digestive system! The chiropractic adjustment is what allows the body to shift out of that sympathetic survival state and into the parasympathetic digestion state. When your digestive system is happy, you are happy and we are honored to help you achieve that!